According to Indiana State Police, a Maryland man who is wanted for failing to appear in court in that state is now under arrest for DUI and his passenger is behind bars for assaulting several Indiana troopers. Police report that on Oct. 10, 2017, at approximately 11:30 a.m., Indiana State Police Regional Dispatch received a report of a road rage incident between two drivers on I-65 near the 215-mile marker (Rensselaer Exit) in Jasper County. Police say that the vehicles continued on I-65 northbound and exited at exit 230 (Roselawn/Demotte) where Master Trooper Glen Fifield observed the TrailBlazer following the complainant’s vehicle at an unsafe distance. A traffic stop was initiated by M/Trooper Fifield on the suspect vehicle at the intersection of I-65 and S.R. 10. 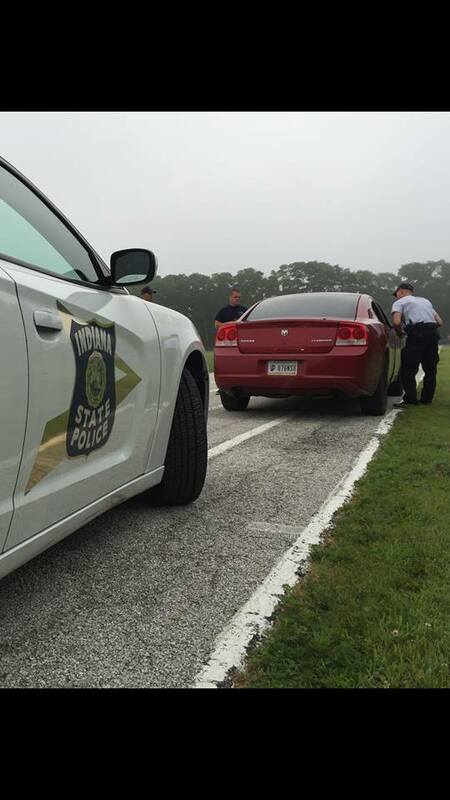 Troopers Paul Arnold and Master Trooper Lionel Douglas also assisted in the traffic stop. Preliminary investigation by Trooper Arnold revealed that the driver, Joseph Biacan, of Derwood, Maryland, had the strong odor of an alcoholic beverage on his breath. Numerous open containers of alcohol were also observed in the vehicle. Trooper Arnold administered several field sobriety tests and a portable breath test at the scene. A certified breath test was also later administered with a result of .09% blood alcohol content. While at the scene of the traffic stop and prior to the field sobriety tests, a female passenger in the TrailBlazer, later identified as Nicole A. Jacobson, 30, of Waianae, Hawaii, was asked for identification as well as a statement as to the road rage incident. During this interaction with Troopers, Jacobson became combative and uncooperative. Troopers also detected a strong odor of alcoholic beverages on her breath as well as having observed open containers in her lap and on the floorboard of the car. During questioning by Trooper Arnold, Jacobson started to stumble into traffic and wasn’t cooperating with verbal commands. Trooper Arnold attempted to handcuff Jacobson when she became combative with him and other Troopers. Jacobson began to kick and hit Troopers during the arrest. While re-securing her in the police car, she kicked a troopers hand as it was rested against the door, but he was not injured. While sitting in a police car, Jacobson attempted to remove the handcuffs and kick the dash of the police car. While re-securing her in the police car, she kicked a troopers hand as it was rested against the door, but he was not injured. An ambulance was called to the scene for a welfare check due to Jacobson’s high level of intoxication as well as her stating to officers that she was pregnant. Jacobson was transported to Franciscan Health in Rensselaer where she was medically cleared for incarceration at the Jasper County Jail. While at the jail, Jacobson physically assaulted a corrections officer during the booking process. Jacobson is being charged with two counts of Battery on Law Enforcement (Level 6 Felony), 1 count of Resisting Arrest (A Misdemeanor) and Public Intoxication (B Misdemeanor). Joseph Biacan was also incarcerated at the Jasper County Jail and charged with Operating While Intoxicated (A misdemeanor). Joseph Biacan, of 4900 McCall Street, Rockville, Md., is wanted on an open warrant in Montgomery County, Md., for violating a peace order filed in District Court on Aug. 8, 2017. Biacan was due in Court in Rockville, Md., on July 30, 2017. Biacan was arrested by Montgomery County, Md., Police Officer Eddie Alesich on May 28, 2014, at 9:20 pm for driving while impaired on 16254 Frederick Road in a 1996 Chevy. On Oct. 14, 2014, Montgomery County States Attorney John McCarthy dropped the charges. Date: 03/15/2012 Converted Amount: $1,000 Notes: BAIL SET $1,000 PER ARREST REPORT. Detention Facility: Oahu Community Correctional Center Converted Amount: $11,000.00 Notes: EXEC. BW REC’D. RETURN ON BW/CALENDAR CALL SET FOR 10/22/14, 8:30 A.M.
Related Case No related cases were found. Arraignment and Plea NICOLE A JACOBSON 03/15/2012 08:30:00 Honolulu Courtroom 8D ALAKEA Martell, Linda S.
This entry was posted in Arrest bookings, DWI arrest photos, DWI Arrests by State, DWI crash photos, repeat offender and tagged Driving Under the Influence, driving under the influence of alcohol, drunk driving, DUI, DWI, Franciscan Health, Hawaii, Indiana State Police, Indiana State Trooper Arnold, Jasper County Jail, Joseph Biacan DUI in Indiana, M/Trooper Fifield, Master Trooper Glen Fifield, Montgomery County States Attorney John McCarthy, Nicole A. Jacobson, Troopers Paul Arnold and Master Trooper Lionel Douglas, Waianae. Bookmark the permalink.